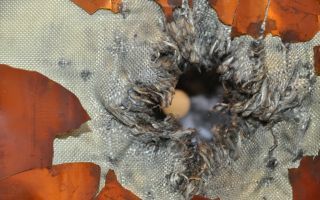 This cool space wallpaper shows an exit hole through Kevlar–Nextel fabric after hypervelocity testing of the multilayer shielding for ESA’s ATV space freighter, simulating an impact by space debris. This cool space wallpaper shows an exit hole through Kevlar–Nextel fabric after hypervelocity testing of the multilayer shielding for ESA’s ATV space freighter, simulating an impact by space debris. The good news is that testing confirms the spacecraft's pressure shell would survive such a collision intact. Testing was carried out for ESA’s Space Environment and Effects section at the Fraunhofer Ernst Mach Institut for High-Speed Dynamics in Brühl, Germamy, using a high-performance light-gas gun.